"This platform is as marvelously durable as it is easy to keep clean." This platform is as marvelously durable as it is easy to keep clean. Even after two years now, all pieces remain tightly fitted together and in excellent condition. We have decking in our sleeping area, and mom recently got us more for our outside run. Good thing because the Oregon rains start soon. We are water dogs, but we don't like laying around in puddles. The decks are nice. "The puppy is able to chew on it, but it's pretty chew resistant!" Very high quality. I got them for my labs that eat everything in sight! The puppy is able to chew on it, but it's pretty chew resistant! "Very easy to clean and light enough to move around"
I like that they are very easy to clean and light enough to move around; yet, they are very sturdy. "It has been great for us, and we definitely recommend it." 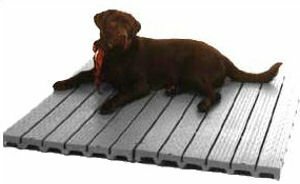 The deck is durable, easy to handle, and keeps pets off the concrete/ground. The raised styling allows for circulation and doesn't hold odors. My only suggestion is to purchase extra clips because they do break occasionally when lifting the deck to clean under it. It has been great for us, and we definitely recommend it. "I have a much easier time moving them around than wooden planks." Old English Mastiff. Family pet. I use the kennel decks to stack my hay on for my horses. I have a much easier time moving them around than wooden planks. They keep my hay off the ground. "I'm very pleased with this product." I recently purchased an outdoor kennel for my dogs. This flooring is very well made and keeps the kennel well maintained and isolated. I'm very pleased with this product. Great products!!!! Easy to maintain and keeps the dogs clean. The flooring served the purpose of elevating bedding off the concrete floor. Love it! "Really like my kennel deck." Really like my kennel deck. Dogs enjoy relief of being on concrete. Used one piece on Kuranda bed for a chewer. So far no problems. "Perfect for my little dogs and big dogs alike!" Perfect for my little dogs and big dogs alike! Does a perfect job of keeping our kennel clean and comfortable. Installation was easy, the quality is great, and our dog loves it. "Works just as it should." Durable/Not as bug resistant as advertised. Honesty it felt a little cheap for the price. I was expecting a hard plastic and pulled out a pretty brittle flimsy section of decking. Ended up returning it and went a different way. 3-Pack covers 24 sq. ft.